This is the first Doubles! Cross Stitch & Wool Applique all in one leaflet. Finishing instructions included. 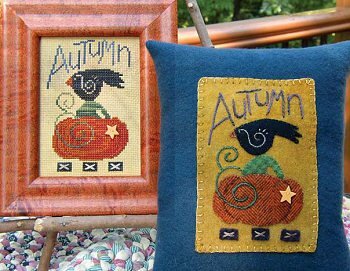 design size cross stitch 46 wide x 74 tall, appliqué 4" x 6"
Cross Stitch Autumn Crow is stitched on R&R Reproductions 14 count Busy Bee Aida, with Crescent Colours floss in Black Coffee, Desert Mesquite, Fallen Leaves, Khaki Mocha and Smoke, with JABC pack 7080. Old Colonial Designs frame. Wool Applique Autumn Crow is created with Weeks Dye Works over-dyed wool in Collards Houndstooth, Dungarees, Eggplant, Kohl, Sweet Potato Herringbone, and Whiskey. Details with Weeks Pearl Cotton #5 in Holly, Mulberry and Whiskey and Weeks 6-strand cotton floss in Cocoa, Hunter, Onyx and Terra Cotta and blanket stitched to a wool pillow.